Click Here to see the eventual ground wire solution that was implemented. CLICK HERE to see switches and knobs functions illustrated. NOTE: There never-was nor is a ground wire to ground the strings. The gold color line (DRAWN in gold so you can see it) from the vibrato base plate towards the rear knob shows where the strings ground could run from under the edge of the vibrato base plate to under the pickguard into the electronics assembly where it would be WRAPPED to the case ground (never solder such a pristine / original guitar that has never been disturbed / re-soldered. See the hypothetical wire drawn in red in the picture below this one. A remarkable selection of color matches for the wire strand can be found in fingernail polish racks at large department stores. Allow the fingernail polish to dry overnight before installing it upon the guitar. Ground wire, ground wire, .....where is the ground wire ? ! Look closely; It's DRAWN there, to scale ! Leads are grey insulated Belden Cable. When a tone pot is turned all the way up, ie. in the full treble position, ...the pot's full resistance value stands between the signal and the capacitor that feeds to ground; So the greater the pot value, the less signal can get to and bleed through the capacitor to ground. So we can see that a 250K pot would allow more signal to bleed to ground through the capacitor than a 1Meg pot that would block almost all signal quite well; And so a 250K pot would give a guitar a somewhat bassier tone for a particular capacitor value than a 1Meg pot would, when the pots are turned all the way up to full resistance. On this guitar you will notice that the volume pot at 1Meg is used to accomplish the same purpose, while the volume pot will be much more sensitive to changes than a 250K or 500K pot; Although bleed over through a cap can occur as the volume is turned down to lower volume settings; Simply a matter of engineering design preference, usually with the advice of knowledgeable Guitarists in the engineering Research and Development department. But when a tone pot is turned down, it's resistance is reduced and allows more of the signal to get to and go through the capacitor to ground, and the frequencies that get through the capacitor are determined by the capacitor's value. When the pot is turned all the way down there is no pot resistance, so the only thing that stops all the signal from going to ground like a volume pot is the capacitor that only allows some of the frequency range to go to ground. So the capacitor alone determines the tone passed to ground with the tone pot turned all the way down. The chart on the right shows the range of frequencies that are blocked and that are allowed to pass depending upon a capacitor's value. (uF = microfarad). Another condiseration is that it takes power (voltage) to push signal across a capacitor; And the higher the frequency, the less power it takes; So as a tone pot is turned down from full on, it commensurately increases the voltage across the capacitor, with the highest frequencies crossing the capacitor first at lower voltage, while more and lower frequencies will cross the capcitor as the voltage is increased by the tone pot / resistance being turned down, UNTIL the frequencies reach the minimum crossover frequency of the capacitor's value; And that's why the tone pot gets bassier the more you turn it down thus turning up the voltage entering the capacitor. 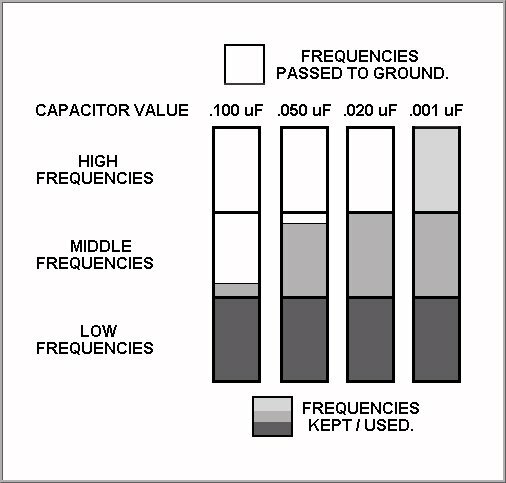 RECAP: The most common tone pot capacitors values are between .050 and .020 uF. The resistance value of a tone pot will effect tone at the full on / full treble position, and how fast the tone will roll off across the bassier tone range when the knob is turned down. The capacitor alone will determine the tone with the pot turned all the way down. Notice that this guitar's tone caps values (.047 and .020 uF) fall near the extremes of the normal range. In the chart below the capacitor value columns and frequency range sections are samples of the both, when in actuality both capacitor values and frequencies are spread across a spectrum of both. Bad tone pot symptoms: In a guiar, cap failure is most often due to being handled and damaged, or deterioration with age, or a combination of the two as a cap gets old and delicate. An open cap (the most common cap failure) will make the tone pot simply not work. A shorted capacitor (rarer but not uncommon) will make the tone pot act like a volume control; Keeping in mind that a capacitor can be of such a large value that it will allow most of the signal to pass and seem like a volume control that has only a little bit of volume with the tone pot turned all the way down. A cap can also get tempermental and act like a different value; If the space between it's plates gets too close it will act like a higher value as lower frequencies can jump the gap with less signal voltage; Or act like a lower value if the plates somehow get farther apart and takes more signal voltage to push the lower frequencies across the gap in the plates. Tricks I have used: A toggle switch, slide switch or push-pull pot switch can be installed to take either the tone pot or tone cap out of the circuit for a full tone sound; Best to switch the whole pot out of the circuit since doing so takes out a few other subtle quirks with pots. Or a rotary switch or row of mini-toggle switches or multiple push-pull pot switches can be installed to select different caps into a circuit for selective tone changes. Where acoustic-like tones exist on tone pots: (1) Roll the volume pot back to about 85% volume. (2) Turn the tone pot all the way down, then slowly start turning it up until you hear the trebles tone just starting to come back in. (3) Make very small adjustments to the tone control to get the type of small or big acoustic tone you desire. (4) You can fine-trim that tone with the volume control. (5) If you desire to play rythm at a lower volume level, then set the volume control lower and repeat the above process. * The high static impedence of these pickups would be deceiving to a Guitarist that would anticipate narrow dynamics associated with high output of higher impedence pickups and thier usually heavier magnets. These pickups are a rare departure from usually being able to judge dynamics by lower static impedence and thus lighter magnets matched to lower impedence coil windings. The reason these pickups depart from that norm is because even though their number of windngs and magnet size is comparable to most other single coil pickups of that era, specifically for higher dynamics, .....they are wound with very fine wire which has more resistance than more common thicker wire. These pickups common range of windings, and magnets balanced to same, gives these pickups even more dynamics than, say, a Fender single coil of that era with about 6K ohms static impedence; But the fine wire and higher resistance also gives these pickups a very compressed signal quality and sound, and quite intriguing to me how much that compession makes high gain settings on just about any amp sound like an old Marshall ! None of this is by coincidence; DeArmond pickups inventer Harry DeArmond knew pickups extremely well and knew quite well what he had designed, ....even to the point that the coils of these pickups are wide and thinner than the usual taller and narrower coils of other single coil pickups. This gives these pickups more sensing along a longer length of the strings, thus more tonal quality and very sensitive. Although Harry probably didn't invent 2-hand fret tapping, he became reknown for using it extensively to demonstrate the volume & tonal sensitivity of his pickups "that didn't even need plectrum picking" ! That introduced the technique to the Public and Guitarists at-large. These pickups have an extremely wide and robust range of tones for any style of playing, .....from jazz and country music popular when they were invented in the 1940's, to almost as though Harry knew that Rock'n Roll, Electric Blues, new Jazz forms and Heavy Metal would come along and these pickups would serve those styles deliciously well too !